Mail4Rosey: Monkey Mat is Going to Interest You...whether you have kids or not! Monkey Mat is Going to Interest You...whether you have kids or not! Disclosure: This post was written on behalf of Monkey Mat and US Family Guide. All opinions stated are genuine and my own. On the left: Not happy to sit in the grass and play with his Pokemon cards. On the right: Ah, that's better. He can sit or rest on his back or tummy, and better look at/play with his cards. My youngest child likes to play in the yard. 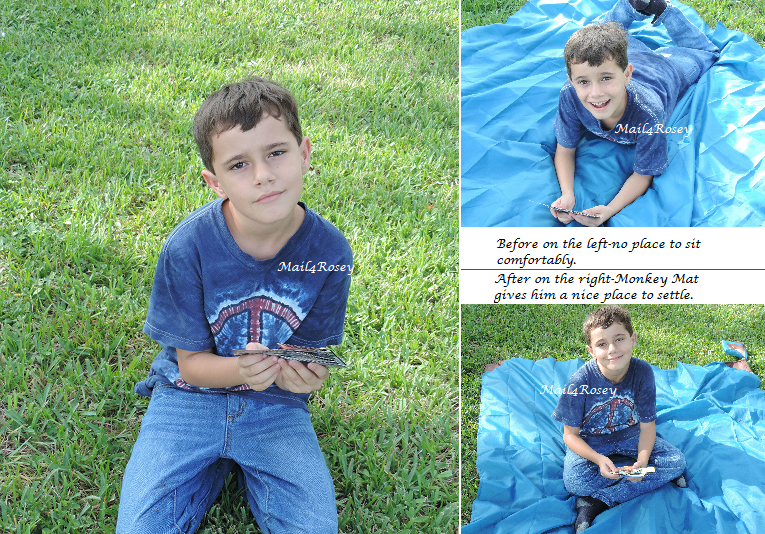 He also likes to play Pokemon cards with his friends, often times outside. The trouble is they don't just want to sit in the grass. It's itchy and has (oh my gosh!) ants and other creepy crawlies in it that might get on them. ;) The solution for this and any other place you need to toss down a lightweight, sturdy, waterproof mat to sit on? Monkey Mat. Monkey Mat is great for many reasons, first and foremost because it is extremely portable. The 5' x 5' mat folds into a small little self-contained square, allowing you to easily take it most anywhere. The corners are weighted, and you can see on the corners that you have a loop for stakes. These sturdy plastic stakes can be attached at the corners to keep the blanket straight and attached to the ground, even when people are moving on the mat. You can tuck these right in the bag when it's time to fold it up and put it away. The center of the mat has loops on each corner of the Monkey Mat logo. You can hook toys and things there to encourage little ones to stay in the middle. The self-containment zippered pouch stays hooked to the corner so you never lose or misplace it. Keep the mat in your purse, car, backpack, carry-on bag, or most any other place. It folds up nice and compact so it's easy to take on the go. I'm keeping ours in the car for impromptu (or planned) trips to the park or beach. Monkey Mat is a good investment that you're bound to use time and time again. I'm thinking it would be great for the 4th of July, picnics, concerts, airports (the reason it was designed...you can read more about that here), hiking, beach trips and even, like we used it this time, for quality time spent chlling with the kids in your own back yard. Of course you don't have to be a kid to appreciate the value of this Monkey Mat. Adults sometimes need a place to sit down too when they're out and aboutk and this is perfect, every single time. The Monkey Mat is made of soft, durable ripstop nylon material. It is water repellant and machine washable too. You can learn more about Monkey Mat by visiting their website. You can also follow them on Facebook and/or Twitter. This is wonderful to have. I even have my students sit in the grass for critiques. We've gone outside to critique artwork. I pull out as many blankets out of my trunk as possible, but not all of them can fit on 2 blankets. We normally have a mat in our car for moments wherein we just want to stop at the park and spend some quality time together! This one's pretty cool! Love this mat. So often the blanket we use ends up flying in the air. Oh that would be nice thing to have around! I can see it being perfect for the backyard or parks. Nice mat. Will let my daughter know about it. This would be so handy to leave in the car. We go to outdoor concerts, the park, and the beach a lot and it would be much easier than taking bulky chairs! Sounds like a good buy to me! We always need such things when we are going out and we often end up not enjoy a moment because we have make do with newspaper or emergency towels in car! I dont have kids, but I need this in my car! Really interseting mat.. Nice one.. Kids and adults also will love it! Nice product for a picnic blanket. This is versatile for dry and moist surfaces. Good to bring for camping and hiking trips as well. I need a monkey mat. It's handy and you can practically have a picnic anywhere. a new spin mop with hands-free wring feature, join the raffle live on my blog! This mat is so cool and easy to take to the park or beach.I need to get one of these. Thanks for the information on this Monkey Mat! And if you hang it over a clothesline, you have a tent. It looks much easier to clean and more durable than a towel. Your boy is cute as always. I believe this is perfect for picnic and the like kind of activities. Definitely, not really essential to have kids to enjoy this. But sure this will give you convenience if you have kids with you. Folding items are so easy and flexible. 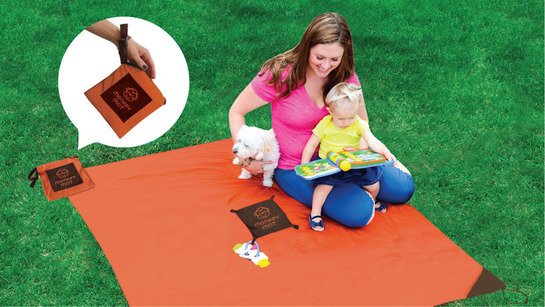 This monkey mat is cool for outdoor bonding. Well, people will always patronize this kind of item. Looks cool. Easy to carry and great for kids. I would try out for sure. It also blends perfectly with varieties of fruits. Party fun mode activated. Not sure what I like more... the weights on the corners or the loops in the middle. This sounds awesome. This would be awesome to have in the car since it would be easy to tuck away. The stakes really are the finishing touch. My kids too love outdoor activities and they usually play in the yard. The Monkey Mat sounds like a great solution to make sure they feel comfortable while sitting there and I love how easy it is to carry anywhere! The monkey mat looks really comfortable and light-weight. But always remember not to tug it back in immediately as there might be bugs and mites! Haha... I'm sitting on a cold floor of an airport & reading this. Lolz.. I love that the mat is easy to carry and is also machine washable. Love the idea of the monkey mat. It cN be used anywhere anytime as it is so easy to keep and does not eat tol much space. I like that the bag it comes in stays attached to the blanket so it doesn't get lost. We would definitely find a lot of uses for this neat mat! This would be great to have a picnic or snack on while playing at the park!